Michael Ronen (MBA ’98) is managing partner of SoftBank Investment Advisers, where he focuses on investing in next-generation automotive and transportation companies, as well as artificial intelligence and communications companies. In 2017, SoftBank Group launched the $100 billion SoftBank Vision Fund and recruited Ronen from Goldman Sachs. Ronen spent 19 years at Goldman, most recently as a partner and managing director, co-chief operating officer of the Global Technology, Media and Telecom Group. Previously, Ronen had served as a noncommissioned officer in the Israeli Air Force Intelligence Corps and later worked as an attorney. He earned an LLB (JD) from Tel-Aviv University in 1994. Ronen lives in California with his wife, Shira (MBA ’98), and has three children. 1/ What led you to join Softbank Investment Advisers and an enhanced focus on the technology sector? I believe that Masayoshi Son is bending the arc of history in business. The size of the SoftBank Vision Fund is multiples larger than any other technology fund ever, so it’s truly historic. And the Vision Fund was set up to invest in technology, media, and telecommunications companies, all of which I’ve worked with on M&A for the past 20 years. So when Masa suggested I could work on the Vision Fund not as an advisor, but from the inside, it was compelling. 2/ You spent nearly two decades at Goldman. What’s been the biggest adjustment to your new role? Goldman is a powerhouse that has perfected its craft and has an incredibly strong culture. Leaving that for what is essentially a $100 billion start-up, helping it grow from about 20 to 200 investment professionals in 18 months, and all the while backing some of the world’s most ambitious entrepreneurs—they are worlds apart in their pace and culture. I’m thrilled to be part of it. 3/ What do you find attractive about AI investment? I’ve spent a lot of time in my career reflecting on change: what causes it, and how businesses can turn it to their advantage. 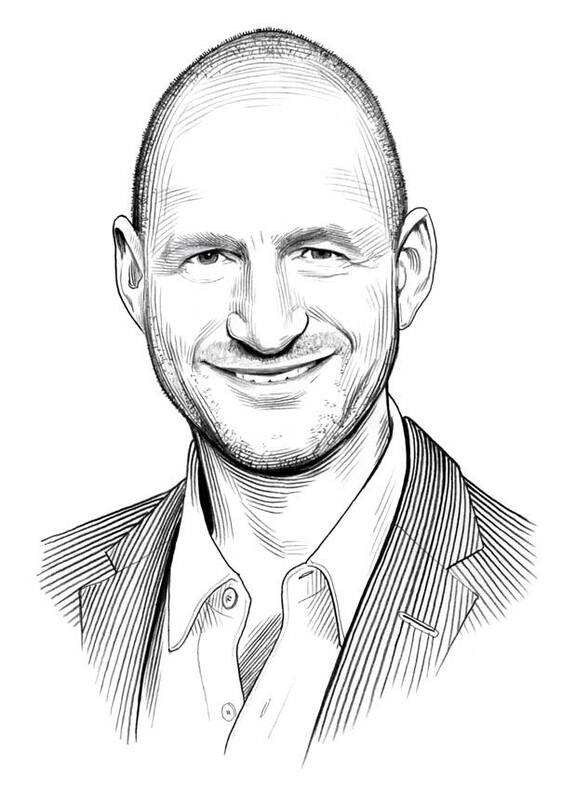 One of the privileges of my Goldman career was the opportunity to work closely with clients such as Steve Jobs and witness the massive disruption that Apple brought to the mobile communication ecosystem. I think we’re approaching a similar storm of disruption—Uber, GM, Google, Apple (reportedly), and many others are working on applying AI to transportation. I’m convinced this will affect our lives just as much as the smartphone. AI sits at the heart of so many developments, and it’s incredibly stimulating to be a part of the transformation. 4/ How do you keep on top of the exploding AI scene across every sector and around the world? Keeping on top is about getting to know the experts, and thanks to the Vision Fund, we’re privileged to have a front-row seat to their work. Partnering with visionary founders is precisely our objective, something that we’re helped in by the global footprint of our team of partners across SoftBank. 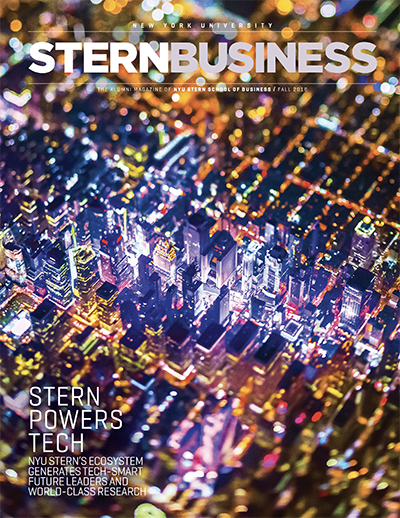 6/ Why did you choose Stern for your MBA? When I applied to Stern, I was a young attorney working in Israel who had finished a stint in the Israeli Air Force Intelligence Corps. I had a strong desire to move to the center of global commerce to pursue a business career, if only to move back to Israel to apply what I learned back home in the nascent Israeli technology scene. Stern was nearly unique in offering competitive scholarships, so when my girlfriend— now my wife—Shira and I both won, we couldn’t turn the opportunity down. 7/ What are your fondest memories of your time here? How new and different everything felt compared to going to school in Israel. I realized Stern was giving me a oncein- a-lifetime opportunity. I’d anticipated a purely academic journey, but I discovered it was a professional one, too. I quickly realized I needed a business suit, and learned that ‘network’ was a verb, not just a term from computer science. Stern was about new life experiences, too. I’ll never forget my first tiny apartment in the East Village, or Thursday night beers with friends—not an experience I was used to in Israel! 8/ What aspect of the MBA program was the most valuable to you? Being so closely integrated into the business life of New York City. To be able to take a class at a great school of finance at 10 a.m. and be speaking to a Wall Street executive three subway stops away by midday was immensely valuable.